When filling out a form, there usually are too many questions, so when I see a long-winded question that is completely unnecessary, that causes me frustration. Especially given the time it took to fully parse the question and two answers. The "what type of bike commuter are you" question has two very long descriptions, requiring a lot from the user. But notice how that answer is directly tied to the previous two "no/yes" questions. 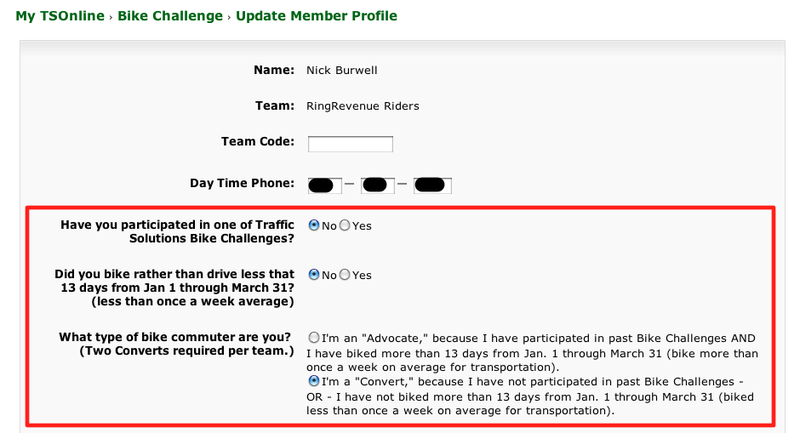 This form would be so much better if after you answered the two questions, the next line said: "Type of bike commuter: Convert (because you have not participated in a Traffic Solutions Bike Challenge)". Also, notice how the second "no/yes" question says "did you bike less than..." but in the type of commuter question they use "you biked more than...". An extra layer of language parsing required. Lesson: reduce level of effort and improve usability by calculating results for users, rather than asking them to input redundant information. This will also lead to more accurate data.